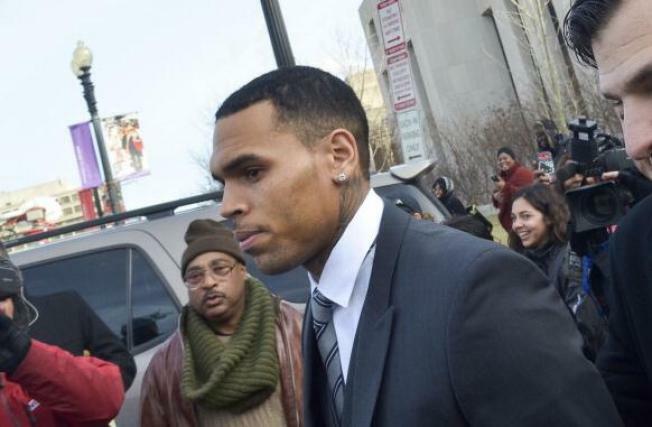 Singer Chris Brown and his bodyguard, Chris Hollosy, each rejected a plea deal for one count of simple assault Wednesday afternoon at a status hearing in a case in which they are accused of hitting a man outside a Washington, D.C., hotel. One of Brown's lawyers, Danny Onorato, said outside of court that attorneys rejected the deal because Brown is not guilty. U.S. marshals cleared the plaza outside the courthouse, shut down the first floor and blocked the entrance ahead of Brown's arrival as about a dozen fans waited to get a glimpse of the star. Some reporters waiting for Brown to arrive were manhandled by marshals clearing a path, News4's Mark Segraves reported. The R&B singer was arrested in the early-morning hours of Oct. 27 after a 20-year-old Beltsville, Md., man said the singer hit him outside the W Hotel on 15th Street NW. 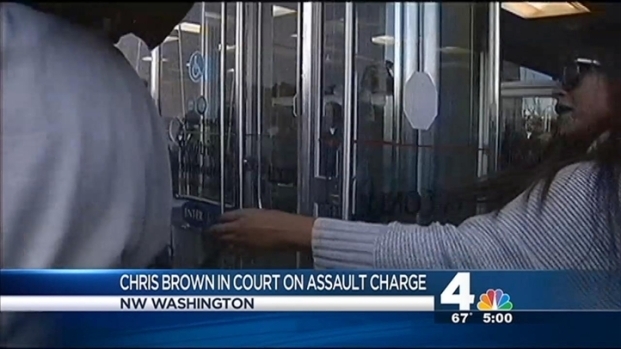 Fans screamed as singer Chris Brown arrived for a court hearing in D.C. The alleged victim attempted to get into a photo with Brown, and according to a police report, Brown told the man, "I'm not down with that gay [expletive]" and "I feel like boxing." The victim received treatment for his injuries at a local hospital and was released. He told NBCWashington that he suffered a broken nose. Brown and Hollosy were initially charged with a felony. Police said the severity of the charge was based in part on the extent of the victim's injuries. But the charge was knocked down to a misdemeanor simple assault charge the following evening, after Brown and Hollosy spent much of two days in a D.C. jail. Prosecutors said in court Wednesday they will be turning over substantial video surveillance shortly but did not say what it shows. The crowd was so thick inside and outside the court Oct. 28 that Brown's first hearing was delayed for hours as court officials struggled to find overflow seating. Brown's mother was so upset she had to be escorted to a private office. Fans of Brown crammed the courtroom and cheered when the charge against him was reduced -- an outburst that got them ejected by the judge. There was a wild scene outside a court hearing for Chris Brown Monday after he was arrested in Washington, D.C. on a felony assault charge this weekend. News4's Shomari Stone reports. As Brown left the courthouse after his first hearing, he waved to even more fans outside. Some yelled, "Free Chris!" Brown's second D.C. court appearance was originally scheduled for November, but was delayed after his attorneys successfully argued that he should not be forced to leave anger management rehabilitation in L.A. to appear in D.C.
Brown was ordered back to three months of rehab by another judge in November. Brown has to return to court in California Feb. 10 for an update on his progress in rehab. At the time of the D.C. incident, Brown was on probation in California for a 2009 attack on singer Rihanna, his then-girlfriend. As a result of the new charge, a judge revoked Brown's probation in California, but the ruling didn't alter a requirement that Brown complete rehab and community service, including roadside cleanup and graffiti removal. Brown faces up to 180 days in jail and a $1,000 fine if convicted. "Mr. Brown committed no crime," said his attorney, Danny Onorato, following the October hearing. "We understand that his security staff acted to protect Mr. Brown and his property as is authorized by District of Columbia law." Brown's uncle, Kevin Brown, said in an interview, "I think people target him to get him into trouble." The next status hearing was scheduled for Feb. 20. Brown's attorney requested the singer not be required to appear because he is still in residential treatment and the trip would cost him three days of treatment.